Got a sweet tooth? If you’re in Pigeon Forge, we’ve got you covered! 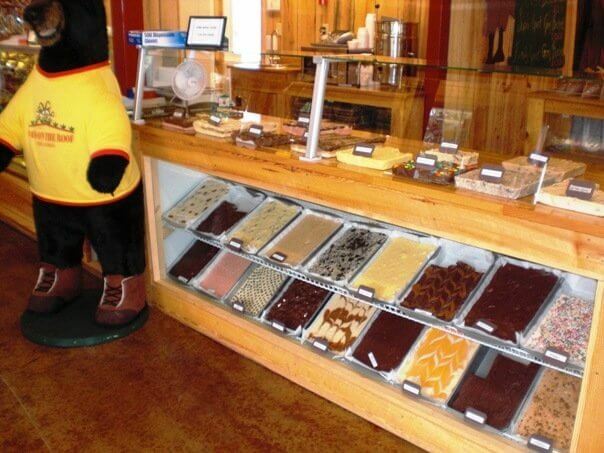 Taffy, premium ice cream, and fudge should help fix you right up. Smoky Mountain Candy Makers—Taffy, Taffy, Taffy! Who doesn’t love taffy? Watch how they make it with the Tennessee Taffy Making Machine. The taffy is wrapped on an old fashioned taffy wrapping machine built in 1940. Enjoy homemade fudge, 30 different flavors of taffy, hand-dipped chocolate, Tennessee mud pies, assorted candies, caramel apples, and seven varieties of sugar-free candies. Mad Dog’s Creamery—HERE’S THE SCOOP! Mad Dog’s has a full selection of hand-dipped premium ice cream in handmade chocolate waffle cones, sundaes, banana splits, floats and the best handmade milkshakes in town. Mad Dog’s has added delicious espresso drinks, shakes, and affogatos and is home of the Big Dog Funnel Cake. This is the spot to satisfy your sweet tooth! Goats On The Roof—What is Goats On The Roof? It’s the attraction in Pigeon Forge that’s impossible to miss! After all, they’re the only Smoky Mountains attraction with live goats roaming around on the rooftop. Stop in, get a can of goat chow and hop on their special “goat-cycle,” which lets you transport your can of goat feed up to the roof. Then get your cameras ready to click away as their hungry rooftop residents chow down on their favorite snack. For a closer view, head up to the second level of their gift shop, where you can gaze out the windows at their bearded friends in air-conditioned comfort. Best of all, there’s no charge to come on in and watch. Then with your sweet treat, you can enjoy the shade of their front porch in an authentic Amish rocking chair. After you’re done, head on over to their old-time gem mine and mine for rubies, sapphires, or emeralds. Find out more in the Restaurants / Sweet Tooth section.